Sunday afternoon I made a trip to the grocery store to pick up some meat and accessories (also known as side dishes) for supper. This was just one more usual trip to Kroger, our much beloved grocery store. The trip was fairly uneventful, parked the truck, went inside, picked up a few fruits, some cereal, some misc items, then made the usual long stop in the meat department. I don’t know what it is about picking out the meat but it usually takes the longest amount of time. There are so many cuts and types, it just gets a bit overwhelming sometimes. I finally chose some pork ribs and went on my way. Upon reaching the parking lot I made an observation which prompted this blog post, I finally discovered the best place to park. This does not just mean that there is a single place, but possibly I have found the most ‘ideal’ spots. I parked next to the cart corral! 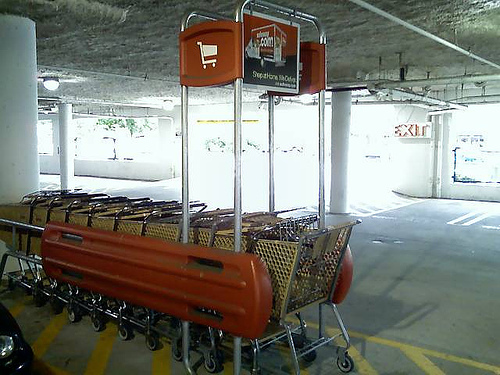 My reasoning is that if a person is less likely to leave a cart out here because it’s so close, there is not a car on one side to ding a door, there is usually one reasonably close to the store entrance, and well when you leave the store the corral is close to the vehicle. Since a person really ought to put the cart up, it’s very likely that a trip would be made to the nearest corral anyway. Let me know what you think, I think this is a great discovery!